With few exceptions, the National League East has become almost the exclusive dominion of the Washington Nationals. The Nats have won back-to-back division titles and have finished no worse than second in the past six seasons. They head into the 2018 season as dominating -350 favorite to win another division crown and a -800 favorite to make the playoffs again. But while Washington is staring down its own demons – its continuous cycle of postseason train wrecks – the rest of this division may be starting to catch up to the Nats. The Mets, just three years removed from a World Series appearance, have top-line pitching. And the Phillies and Braves are ramping up their own expectations after several years of rebuilding their organizations. Outlook: The window of opportunity that has been wide open for the Nationals the last six seasons feels like it is starting to close. Bryce Harper’s impending free agency is casting a pall over this entire organization. And after four divisional series losses in the past six years the pressure is on this core group of Nationals to do something, anything, in the postseason. By now you should know the names. Max Scherzer, Stephen Strasburg, Gio Gonzalez and Tanner Roark spearhead an exceptional rotation. And that rotation’s ability to chew up innings (their starters were No. 1 in innings pitched last year) keeps the pressure off a quality bullpen. Bryce Harper, Ryan Zimmerman, Daniel Murphy and Anthony Rendon will once again form the foundation of one of the league’s top offenses. The big hope for this team, though, is that last year’s big pickup, Adam Eaton, can stay healthy and prove to be the difference maker they thought they had acquired from the White Sox prior to 2017. Add in some proven veterans like Howie Kendrick, Matt Adams and Miguel Montero and the Nationals are deep, experienced and talented. The bad news for the Nationals is that they will be judged by what they accomplish – or don’t accomplish – in October. The whole regular season is just a tedious obstacle that this group has to endure while they try to stay healthy. 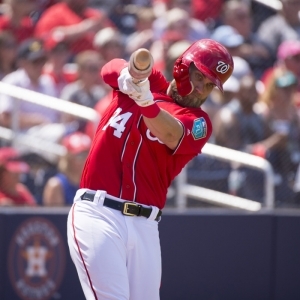 The good news for the Nationals is that the rest of the N.L. East is still pretty bad. They won the division by 20 games last year and the second place team, the Marlins, imploded this offseason. We’ve seen this same group fail time and time again. And as much as I want to believe that they will break through this year, unless they add or find a something to spark then I think this Nationals teams is headed for the same fate as its recent iterations. Outlook: “Could be.” That’s the tantalizing phrase that surrounds this Mets team. They could be the team that challenges the Nationals for the East title. They could be one of the best rotations in the Majors. They could be a sleeper team to win the pennant and get back to the World Series for the second time in four years. Or they could be a dumpster fire like they were last season. No team in the Majors endured worse luck than the Mets last year. The team was racked by injuries and bumbled to a fourth place finish in the lackluster East. Everyone is back, with reinforcements, and New York will once again hold its breath and hope that its injury-plagued roster can hold together. Young starters Noah Syndergaard, Jacob deGrom, Steve Matz and Matt Harvey can be as good as any rotation in baseball. The Mets are hoping that increased health and effectiveness will help them gloss over last year’s biggest weakness: their horrid bullpen. The Mets re-acquired Jay Bruce and added vets Todd Frazier and Adrian Gonzalez this offseason. If they can keep Yoenis Cespedes, their most important player, in the lineup for 130-plus games and get a healthy and productive Michael Conforto back then there is the potential for the Mets to have one of their best lineups of the decade. Everything with the Mets is “if”. They just need to stay healthy. But that’s easier said than done for a group of guys with checkered track records. If the Mets keep their core on the field then they will challenge the Nationals. But if not then this will be one of the league’s bigger underachievers – again. Outlook: After four or five years of from-the-ground-up rebuilding the Phillies think that they might be able to compete in the N.L. East. While the majority of teams stood pat this winter, Philadelphia was active in the market while attempting to put some final touches on a team that could be a potential sleeper for an N.L. Wild Card. If the Phillies are going to take a step forward they will need to improve one of the worst offenses in the Majors. Their biggest pickup was first baseman Carlos Santana. And Philly is pinning a lot on youngster Rhys Hoskins while hoping that his brief, but prolific, output from last fall carries over to a full season of at-bats. I think the key will be Odubel Herrera and Maikel Franco. Those two have to find the next level if this offense is going to be good enough to compete. Jake Arrieta was the marquee pitching acquisition this spring. Even though Arrieta is past his Cy Young prime, the hope is that he’ll serve as a veteran mentor (and innings eater) for a young, up-and-coming staff. Aaron Nola has ace’s stuff. Vince Velasquez is a wild card. And there is a load of depth with at least five other capable, if somewhat erratic, arms waiting in the wings. Philadelphia also put a lot of focus in upgrading its bullpen, which posted a mediocre 4.16 ERA last season while finishing sixth in blown saves (24). If the Phillies can shave just five or six losses off that total, while getting natural improvement elsewhere on the roster, they could be in business. There aren’t a lot of sure things or much experience in this lineup. And the pitching staff has been more potential than production to this point. That said, this team could be ready to make a surge. And if they get off to a solid start it wouldn’t surprise me if they add even more pieces during the season. The value on this team is shrinking by the day, though, as a lot of people are jumping on this bandwagon. Outlook: Everyone and their sister is jumping on the Phillies bandwagon. But if you’re looking for a team that could turn out to be a major surprise in the N.L. East look no further than the Braves. This organization is moving into the next stage of its rebuilding phase. And with plenty of money to spend in next year’s bumper free agent class the Braves could be a team looking to make moves sooner rather than later. The Braves have an exciting young core of players in Ozzie Albies, Ender Inciarte, Dansby Swanson and, when he is brought back up from Triple-A, potential superstar Ronald Ocuna. They all had varying degree of success last year. And their development is not only going to be the focus of this season; it could turn out to be the determinant of it. The youngsters are one of the keys to the Braves season. The other is starting pitching. Atlanta keeps shuffling through retread arms year after year, hoping to catch lightning in a bottle. And they are doing the same thing this year by trotting out one of the weakest rotations in the N.L. But if they get some career years out of some arms in the rotation and the bullpen the it might be enough to shrink the talent gap between the Braves and the top teams in the East. This year is going to be a success for the Braves no matter what. If they stink then they will have the silver lining of getting their prospects valuable experience. But if guys like Freddie Freeman and Julio Teheran catch fire, if the youngsters find their feet, and if they decide to make an early move to acquire one of 2018’s big-time free agents (Manny Machado, anyone?) then Atlanta could make a surprise run at .500 and become a solid value play in the process. Outlook: I’m not going to waste any time with this team. They sold their best players for scraps in the offseason in an attempt to take financial pressure off their new ownership group. The Marlins have about five MLB-caliber pitchers on their whole staff and about three MLB-caliber position players in the everyday lineup. Miami is a glorified Triple-A team that will likely lose 100 games without breaking much of a sweat. Doc’s Sports is offering $60 worth of member’s baseball picks absolutely free – no obligation, no sales people – you don’t even have to enter credit card information. You can use this $60 credit any way you please on any of our top MLB handicappers. Click here for more details and take advantage of this free $60 picks credit today. Robert Ferringo is a professional sports handicapper for Doc’s Sports. He is considered one of the top MLB cappers in the country and has turned a profit in four of five baseball seasons (and six of his last eight). Robert exploded for an incredible +$13,100 profit run last year from mid-April to late July and he plans on doing it again this year. Robert has posted four of five winning years on the diamond and is looking for another big season. Click here for more information on his MLB picks.